Lately I have been struggling more than usual on this journey called life. I have been finding myself filled with the bitterness of disappointments and wallowing in despair about life in general. Last week all of that yuckiness built up to an all time high and situations at work allowed those feeling to implode leaving me an emotional and stressed out wreck. Last night I attended the Winter Cluster meeting for the Ohio Conference of Mennonite Church USA for our region. During the devotional time, Regional Pastor Ralph Reinford, talked about seasons and the different seasons of life. He went on to say that no matter what the season is, it will always pass and change to another season. That made me reflect on what I have been experiencing lately and it filled me with new hope. I have been going through a season of frustrations, and it too shall pass. At home we have been dealing with the changing moods and attitudes of our eleven year old son, Max. I would voluntarily go back to the terrible twos! In addition to the changing family dynamics, impatience with our finances has me chomping at the bit to FINALLY purchase our own home. We are so very close! On the church front there are the usual issues that come up while serving in a small congregation. Changes are being made either too quickly or too slowly, depending upon who is asked. Couple that with the polity issues that are happening around the larger Mennonite denomination as a whole, and there is a recipe for instant frustration. Then there is the guilty frustrations that come when you have new dreams that you can’t quite seem to make happen. I want to embrace this dream of writing and run with it. Unfortunately reality doesn’t agree with my agenda at the moment. It has been incredibly hard to find the time to write regular blog posts, let alone focus on other areas of this dream. I would like to find the time to learn more about the craft of writing to improve my new-found skills. There is also an impatience because I feel so strongly that God has been calling me to this but I don’t know what more I need to be doing with this gift. Should I be focusing on magazine articles? Is it a book that I need to write? Fiction or Nonfiction? However, it is the stresses I have been experiencing at work that were the final straws on the proverbial camel’s back that broke me last week and pushed my frustration level to the moon and back. By Friday afternoon I felt utterly disrespected and disillusioned. The sting of betrayal from a superior was more than I could bear and the blindness of the said supervisor that allowed the perceptions of another employee to take precedence over my proven track record of integrity and team work was like salt to the wounds. I went home for the weekend belittled, indignant, and hurt. Hard work should be the stick we are measured by, not whether we have a degree or what gender we are or what the opinions of other are, right? Why is this happening? Monday morning rolled around. Leaving the safe shelter of my home to go to work was incredibly difficult. The events of last week still plagued my troubled soul and The Dixie Chicks song Not Ready To Make Nice was playing in my head. I quietly hid in my office for most of the day still seething internally. I had heard a Proverbs 31 Ministry Moment on the radio on my way to work that said if I wanted God to fight my battles for me then I need to ask him to do that. When I laid down my head to go to sleep Monday night that thought was bouncing around in my head. I spent a very restless night and eventually woke up around 3:00 am. By 4:30 am I gave up on trying to sleep and decided to get up and spend some extra time with God in his word. I was looking for his comfort and some answers. By the time I picked up my Bible I had concluded that I can’t change people’s perspectives about me. I had also decided that if someone labels you as “difficult” it is not because you actually are, but because they just don’t want to hear what you have to say. And that is okay because it is their problem and not mine. They must be insecure or stubborn, and they are afraid of what might happen if what you have to say brings about a change. To you, O Lord, I lift up my soul. O my God, in you I trust; do not let me be put to shame; do not let my enemies exult over me. Do not let those who wait for you be put to shame; Let them be ashamed who are wantonly treacherous. Make me to know your ways, O Lord; teach me your paths. Lead me in your truth, and teach me, for you are the God of my salvation; for you I wait all day long. Be mindful of your mercy, O Lord, and of your steadfast love, for they have been from of old. Do not remember the sins of my youth or my transgressions; according to your steadfast love remember me, for your goodness’ sake, O Lord! Good and upright is the Lord; therefore he instructs sinners in the way. He leads the humble in what is right, and teaches the humble his way. All the paths of the Lord are steadfast love and faithfulness, for those who keep his covenant and his decrees. For your name’s sake, O Lord, pardon my guilt, for it is great. Who are they that fear the Lord? He will teach them the way that they should choose. They will abide in prosperity, and their children shall possess the land. The friendship of the Lord is for those who fear him, and he makes his covenant known to them. My eyes are ever towards the Lord, for he will pluck my feet out of the net. Turn to me and be gracious to me, for I am lonely and afflicted. Relieve the troubles of my heart, and bring me out of my distress. Consider my affliction and my trouble, and forgive all my sins. Consider how many are my foes, and with what violent hatred they hate me. O guard my life, and deliver me; do not let me be put to shame, for I take refuge in you. May integrity and uprightness preserve me, for I wait for you. Revelation! A flash of insight popped into my head — I am just as much to blame for difficulties I encounter and the frustrations that I am feeling if I don’t trust in the Lord with all my heart. My reluctance to let go and let God lead me through my day has created an opening of bitterness that the Devil is waiting to use to thwart my purposes. This impatience on my part is what is truly causing my unsettled mind! I can’t help how others act or change their perceptions and assumptions about me and I don’t need to. I need to humble myself and allow Yahweh to lead me. He will guide me along the right paths and he will fight any battles for me. I just need to ask him to be my defender. Then I need to allow him to actually lead me gracefully from season to season. Tuesday morning looked a lot different in comparison to Monday. 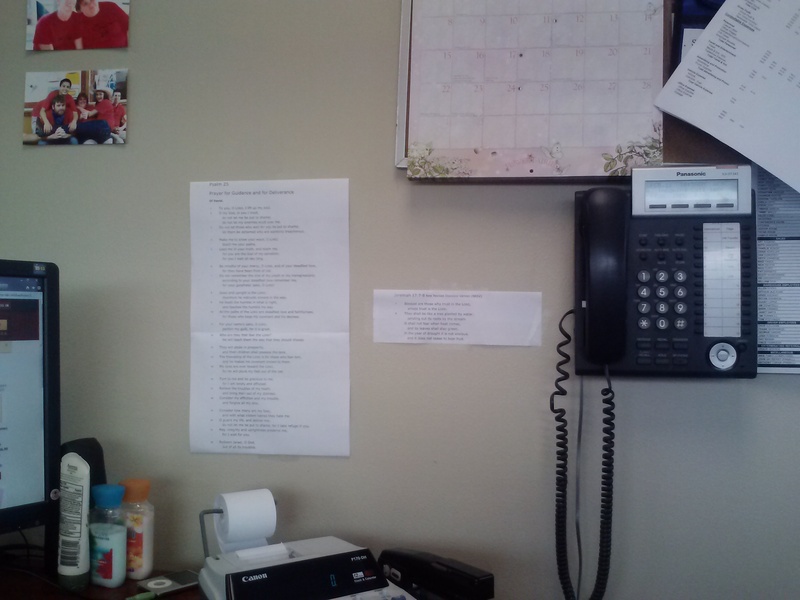 A humble Pixie left for work and I started off the day by reading again Psalm 25 out loud at my desk before beginning the days tasks. For the first time in days I could feel a calm and peace descending over me. These two pieces of scripture from the Old Testament are going to be my mantra, at work especially, going forward. 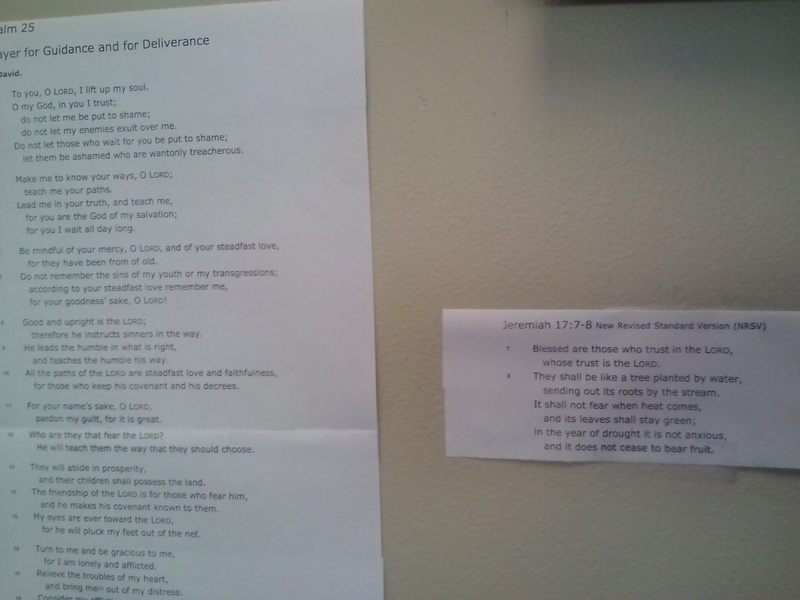 I have printed both passages out and they are now taped on my wall right next to my desk. When I arrive each morning I will be using these passages as prayers to help me center myself for the day and to help set my tone and attitude. It is also handy to have them right next to me as I work through the day. I can quickly glance over and re-humble myself to continue on with strength, grace, and integrity. We all fall down. It is up to us to choose to trust in the Lord and let him help us get back up, or to give a victory to the evil tempter by staying knocked down to dwell on things we can’t change and that are out of our control. No matter what, though, the love and mercy of our heavenly Father is always available to us. Whether we start over right now, tomorrow, or next month, it is never to late to get back up. It doesn’t matter how many times we fall down either. He will always surround us with his love and help us pick up the pieces and start again. Every. Single. Time.